Metal Building Contractor | D.R. Poulin Construction, Inc.
Metal building contractors specialize in designing and building cost-efficient metal buildings for a wide range of commercial, institutional, industrial, and recreational use. If you’re looking to work with a metal building contractor in central New England, D.R. 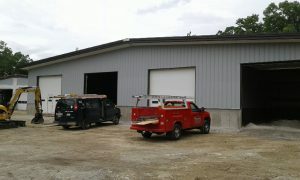 Poulin is the area’s leading metal building contractor. As a high-quality metal building contractor, D.R. Poulin is the only metal building contractor authorized to sell and install Kirby Building Systems, the leader in custom pre-engineered, high-quality and cost-effective metal building systems. In fact, they’re recognized as one of the top ten metal building manufacturers in the world. What makes Kirby Building Systems so attractive for a metal building contractor, such as D.R. Poulin, is that they’re complete building systems including a frame, wall and roof panels, and even a variety of bay options for commercial and industrial uses. Customization can add features and unique functionality without adding substantially to the cost. Configure walls, hallways, doors, work bays, storage space and more. Versatility that enables your organization to quickly expand its space or reconfigure existing space for additional personnel or different purposes. Strength and durability that comes with reliable metal framing and the high-quality design and construction of a pre-engineered building solution. Value in the form of a lower initial investment, ongoing sustainability, and a solid warranty to protect your investment. As a leading metal building contractor, D.R. Poulin beats the competition in a number of ways. All our supervisors are OSHA-certified professionals and we utilize state-of-the-art computer-aided-design technology to provide our clients with accurate, durable building plans and highly-realistic renderings to make it easy to visualize exactly what their buildings are going to look like. There’s not another metal building contractor in our area that offers that kind of service and value. To learn more about all the benefits of working with a top metal building contractor, contact D.R. Poulin today!